Anxiety disorders are characterized by extreme fear, nervousness, or worry on exposure to a feared stimulus, which can be an object, person, or situation. Fear is differentiated from anxiety, in that fear is a reaction to a current stimulus, whereas anxiety is fear of some future stimulus or anticipation of one. Anxiety becomes a problem when one becomes fearful, nervous, or worried out of proportion to the feared stimulus, or becomes nervous or worried about some future stimulus or anticipated event. Fear is a normal response, and is a necessary component of survival. When presented with danger in the environment, a physiological reaction is triggered where adrenaline is released into the bloodstream. Adrenaline is a fear-response hormone which causes several physical changes in the body, including increased heart rate, increased rate of breathing, and dilated pupils. In addition, there is shunting of the blood flow from the digestive system and the skin to the skeletal muscles, which can be felt as having the “butterflies” in the stomach or having numbness and tingling sensations of the extremities. These physical changes allow the person to prepare to fight the danger, or to run from it, the so-called “fight-or-flight” response. The increased heart rate and breathing rate allows the blood to supply more oxygen to the skeletal muscles needed to fight or run, and the blood shunting to the skeletal muscles further aids this process. The dilated pupils allows for improved vision to assess the danger, and the brain becomes more alert and hypervigilant for danger, allowing one to scan their environment in order to deal with the external danger. However, this fear response goes awry when one starts to anticipate danger, or starts to have thoughts about events which overestimate the danger and underestimate one’s ability to cope with the danger. In this situation, the fear response is heightened by one’s thoughts about the event or future event, where the overestimation of danger and underestimating of one’s coping leads to anxiety. Unfortunately, the body perceives fear and anxiety the same way, where the adrenaline response is triggered with either fear or anxiety. So when one has anxiety, the fight-or-flight response is activated, and serves no purpose as the danger is more in one’s head and the way they think or give meaning to the situation. 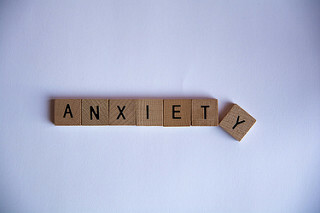 Anxiety treatment involves psychotherapy, with cognitive behavioral therapy (CBT) having the most evidence for efficacy. CBT works on the premise that events or situations do not directly cause the anxiety; rather, the thoughts we have or the meaning we give the events causes the anxiety. CBT works by identifying the maladaptive thoughts, working on more adaptive thoughts, and suppressing/distancing oneself from the maladaptive thinking. In addition, CBT addresses the avoidant behaviors which serve to sustain the anxiety over the long term; this can be a difficult task, as the avoidant behaviors serve to relieve anxiety in the short term. Other forms of psychotherapy include depth or insight oriented psychotherapy, which addresses the causes and the proximal determinants of the anxiety. If psychotherapy is not effective, or if the anxiety symptoms are severe, then pharmacotherapy with anxiety medications can be considered after a psychiatric assessment. Other treatments for anxiety include self-help treatments, natural supplements, and alternative interventions for anxiety like exercise, meditation, and relaxation. Please see AnxietyBoss.com for more information and help on anxiety.